The authors of this game are Gary Kim and Evan Song, graphics are made by Vincent Dutrait. 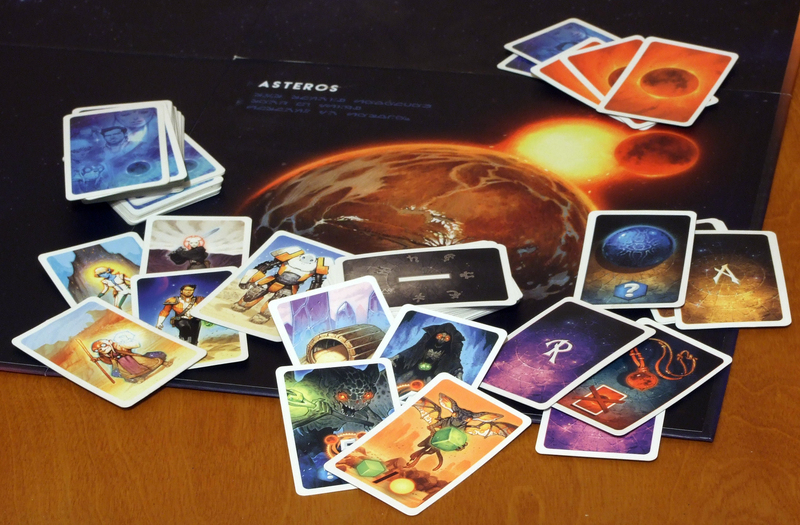 The game had its debut on the Kickstarter where it was backed by 869 people for the sum of almost 58 thousand Euro. Copies from this campaign began to reach players in November 2017. Polish language edition was released by Portal & 2 Pionki and this review will be about this version. 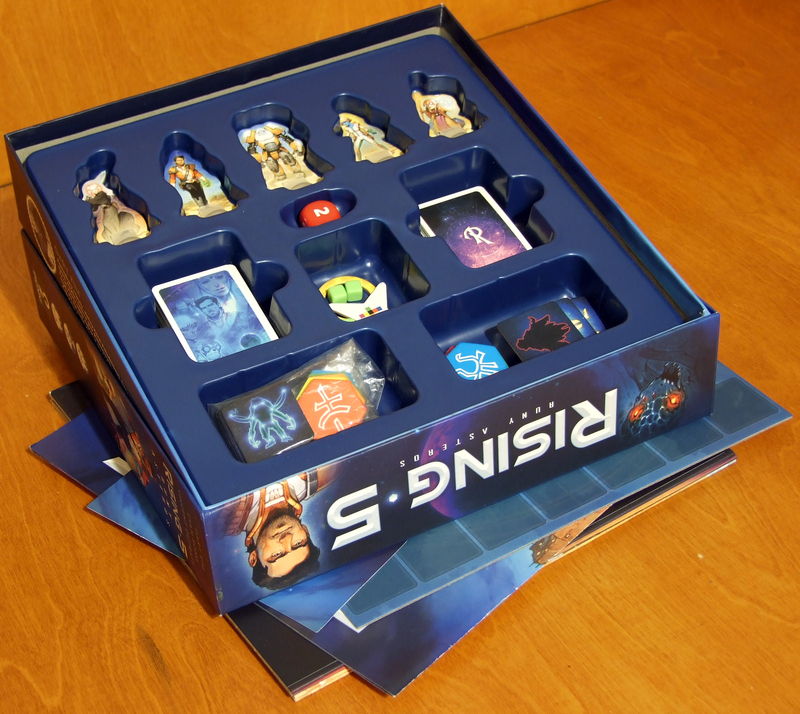 In a standard size box, in a very well-planned insert we will find medium size, folded in four game board, small board for game master, 6 sided battle die, 4 small Silk cubes, decks of small standard quality cards (characters, regions, relics and artifacts). Made of thick cardboard we have character standees, eclipse marker, gate marker and two sets of rune tokens and astrological symbols. The last component is the application managing the puzzle in the game. All elements of the game are illustrated with great graphics, evoking a style drawn straight from the French comic. Seeing fantastic characters I immediately thought about such titles as “The Quest for the Time-Bird” or “Valerian”. The graphic design of this project simply captivated me. One of the hiccups was for me a piece of the board on which we put runes. The appearance of the gate marker is very different from the other components, in my opinion it should be a piece stuck onto the board, which would better keep the runes in place, it would require cutting the board so that it would fold it outside, but it would make the use of it considerably more pleasant. Time to take a closer look at the application. After launching the new game, we are welcomed by the eye-catching short video with atmospheric music. On the main screen you will find an option to view the results of previously played games, start a new game, display the rulebook or use the tutorial. On the game screen, we can proceed to scan the current run layout, check the symbol of a specific rune, or view the reminder of previously checked rune layouts. The option which I miss here, is the ability to save the game – specifically the puzzle layout. When scanning the runes layout, the application requires very precise positioning of the camera and significant brightness, but if light would reflect from one of the runes – it will have a problem with scanning the layout. The solution is to manually enter rune positions, but unfortunately we can’t set it as a default selection, and each time we will have to switch from scanning to manual selection. With this option, there may be a problem apparently resulting from the program’s optimization – it quickly clogs up ram memory and starts to work extremely slow. In my case, we tested the application on several android devices, the worst of which was with 4GB Ram and 1.5GHZ octacore processor. After restarting the application, it worked smoothly for a while, but when entering the manual selection, again it became exorbitantly slow. The previously mentioned inability to save a puzzle, causes that every time we would like to restart the app, or for some reason the application would crash, we have to start the game from scratch. We have an alternative solution, where one player takes the role of the application and checks the correctness of the layout from time to time. 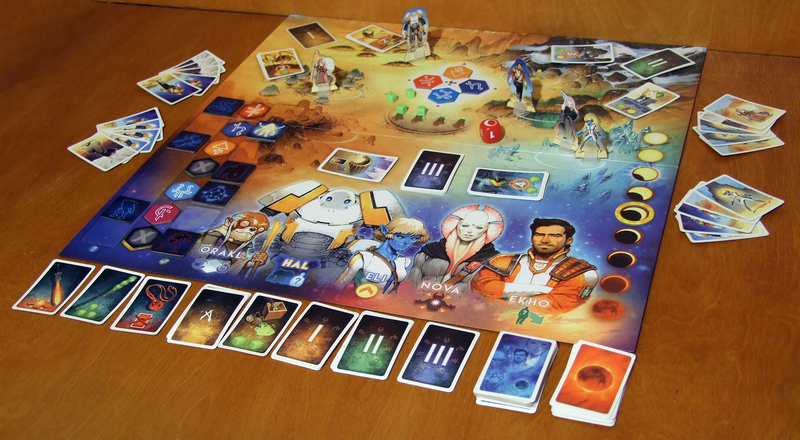 As the Game Master screen, he uses the lid of the game box, hiding behind it a set of additional rune tokens and astrological symbols arranged on the mini board. This part of “game play” in my opinion is extremely boring for a given player and I strongly advise against playing with it. 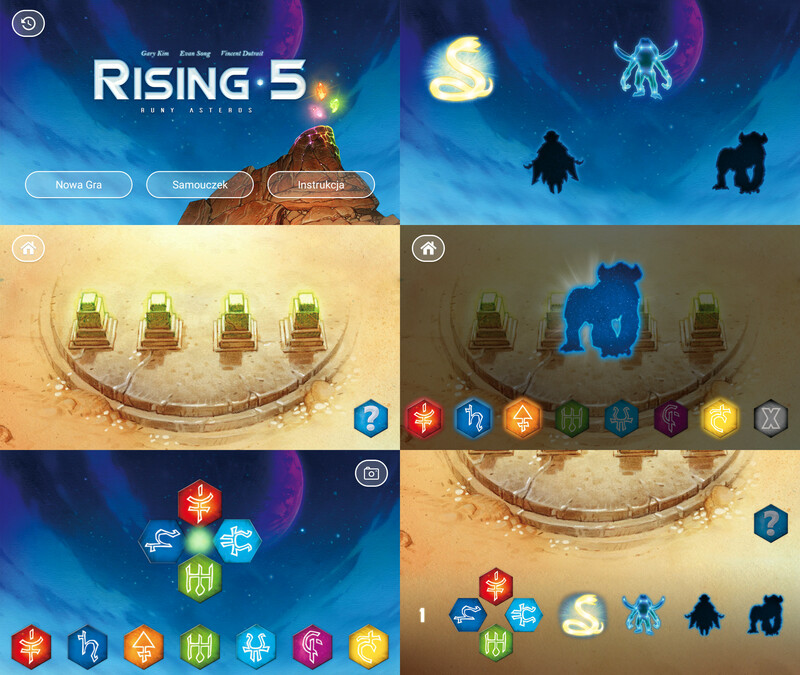 In Rising 5, we will follow the efforts of five heroes trying to save the planet Asteros from destruction. The power of the runic gates, imprisoning unimaginable monsters from ancient times, begins to weaken, threatening with their complete release. To take care of this matter, our team, chased by time and monsters, will have to unravel the riddle of runes required to re-enslave the dark forces. This is how the world of the game is presented to us, unfortunately only in this way. The whole story is summarized in a brief mention on one page of the rulebook, and it is futile to look for something more. Players do not even assume the role of specific characters, but are the team’s managers. The world presented works completely independently of the game mechanics, which in no way draws us into it. In my opinion, this is an unbelievable damage to the visual aspect of the game, which in itself is very atmospheric and fueling the player with a desire for something more adventurous. Mechanically, this game is a relatively simple logic puzzle, where we have to arrange four out of seven runes on specific positions. After preparing everything for the game, we scan the first random run layout chosen by us. 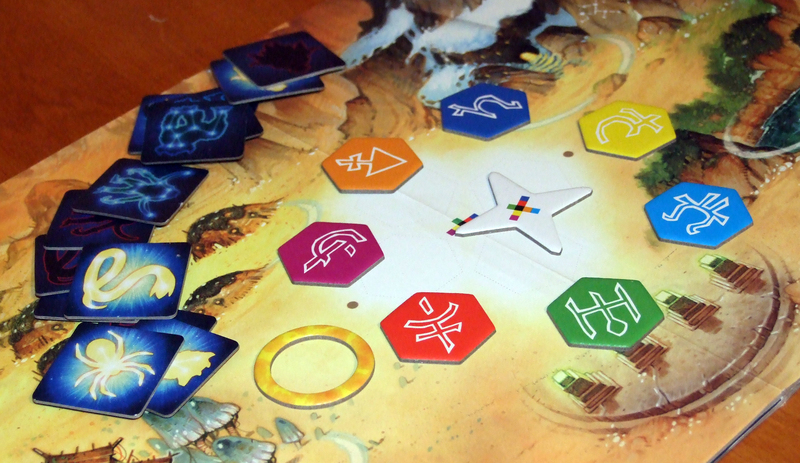 The application assigns a random astrological symbol to each rune, and then informs us how many runes from the chosen set are in the puzzle, which symbols are in place, and which symbols should be replaced. The catch is, that we do not know which rune has been assigned to which symbol. The first set will always consist of two symbols to throw away and two correct ones, of which we have about 50% chance that one of the correct ones will be at its place. 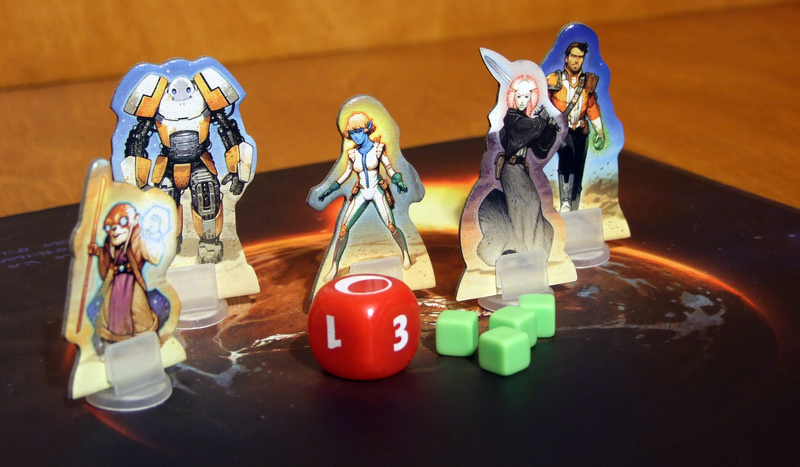 The further mechanical part is the appropriate management of character cards on the hand by each player, and attempts to deal with a random element in the form of a combat die. By discarding the cards of a given character from the hand, we can perform actions that bring us closer to the solution. In the deck we have some hidden cards with the red moon, that will bring us closer to failure by the eclipse. The eclipse marker moves on its track at the time when the moon card should be resolved, or if the battle with the monster is lost. Fighting with monsters is based on a simple throw of a combat die, while other players may discard the cards of the fighting character to increase the result, if it is equal to or greater than the strength of the monster – we win. After a few plays, advanced players quickly will deduct an optimal and effective scheme for solving the puzzle. The only possibility of losing will be on throws of the combat die, because one of its sides is an automatic defeat. This and lack of replayability makes this title very boring for such players. In my opinion, if the puzzle itself was implemented as a smaller element, enriching the theme related to the heavier adventure game, the game would gain a lot. 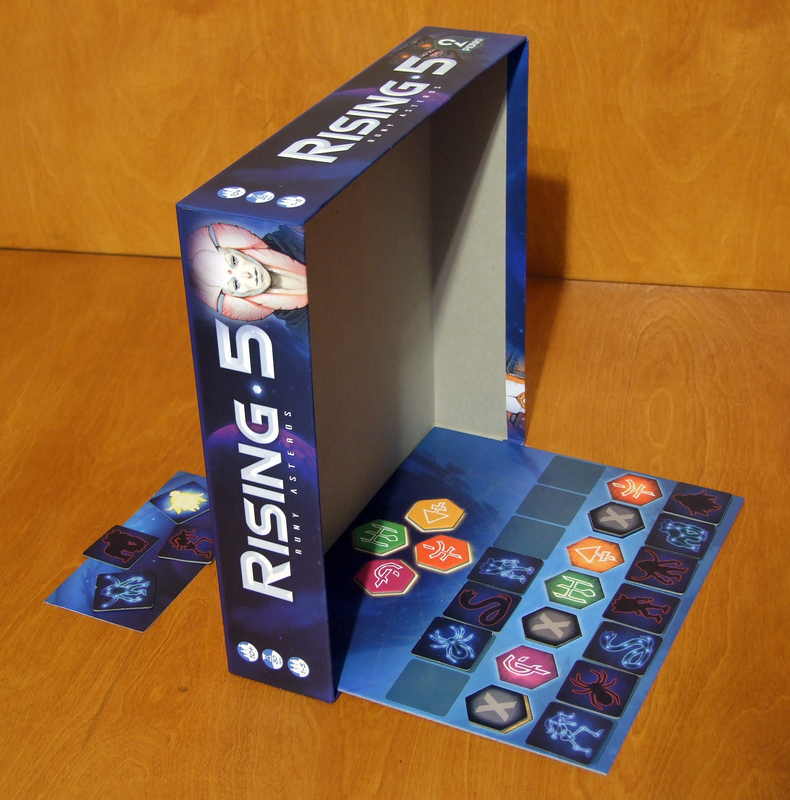 1 to 5 players can play Rising 5, and one play shouldn’t take more than 30-40 minutes. The title should be aimed at younger players, for whom the puzzle should take a little longer to solve, and the pictures will bring them closer to the world of comics until they finds the best way to solve it and then the game will go on the shelf getting dust. I won’t recommend this game to advanced players, apart from a one or two plays just to get to know a neat puzzle. Unfortunately, there is nothing to tie the player to it, and repeatability and schematicity will quickly get him tired of this game. I would love to see the characters made by Vincent Dutra in some more interesting, more immersive adventure game depicting the fate of this team.